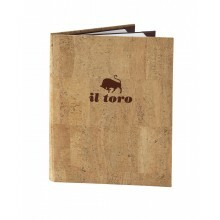 The cover material is made of real cork and is firm to the touch. The uneven natural coloring and mildly-uneven texture create a look that will impress your customers with a sense of understated class. Durability level: 2 out of 5 (Durable). Best suited for dry environments. 1-Year money-back guarantee.